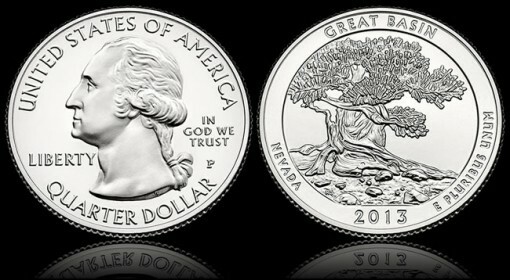 Great Basin National Park quarters will make an official appearance a week from today, Thursday, June 20, 2013. That is when representatives from the National Park Service and the United States Mint will ceremoniously release the Great Basin quarter commemorating the park in Nevada. The coin, the third issued this year and the 18th overall in the America the Beautiful Quarters® Program, enjoyed a different type of launch earlier this week. On Monday, June 10, 2013, Great Basin quarter products went on sale through the U.S. Mint and the coins began their journey to enter circulation through the Federal Reserve. Open to the public and free, the ceremony will kick off at 10:00 a.m. Pacific Time at the Great Basin National Park Visitor Center. This event makes for a special time for children and coin enthusiasts who like to get a first glance at the quarters and grab a roll or two of them. The Great Basin Visitor Center is located just north of the town of Baker on the west side of NV Highway 487. It opens two hours earlier than the start of the ceremony. Launch ceremonies typically last about 30-40 minutes. Immediately after, a coin exchange begins where anyone can swap cash for $10 rolls of the new coins. No information has been provided at this time as to what bank will offer the rolls or whether they will come from the Denver Mint or Philadelphia Mint. Also open and free to the public is a coin forum hosted by the U.S. Mint. The forum will take place on June 19, the evening prior to the ceremony. It will also be held at the Great Basin National Park Visitor Center. The coin forum will begin at 7:00 p.m. and last until around 8:00 p.m. Coin collectors in particular enjoy these events as they can ask questions and learn about upcoming United States Mint coins and products.